With the LN-404C, the world is your oyster when it comes to choosing a head. Normally we are concerned with adding too much weight to a tripod with too big of a head, but that concern is completely dwarfed by the size of this tripod. I recommend getting the biggest beefiest ball head you can find. The tripod will still dwarf it. 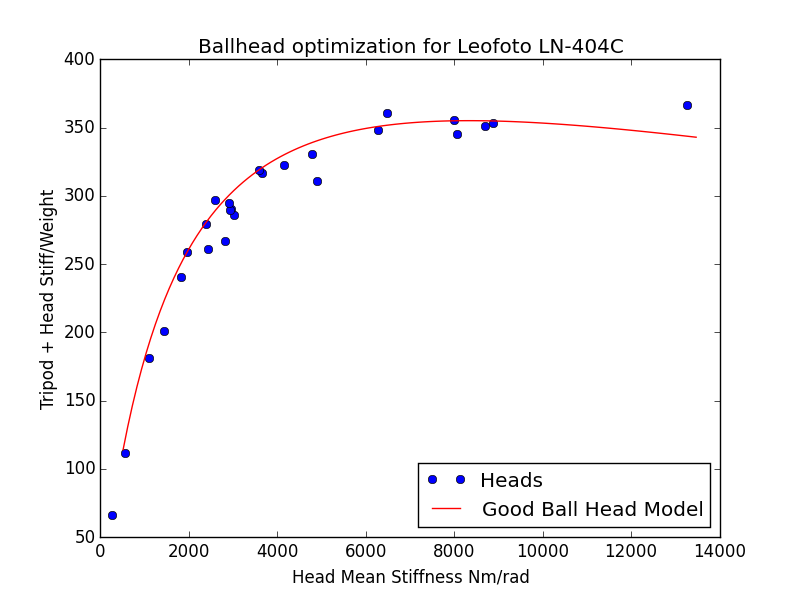 This chart is telling us that you don’t want to put a ball head with less stiffness than about 5000 Nm/rad onto the LN-404C. After that though, knock yourself out and get a really nice full size head that will still look puny on these legs. The LN-404C provides an ideal platform for geared and pan-tilt heads. I suspect most users will not choose a geared head for this tripod as the high quality ones are rather expensive, ruining the budget proposition that the tripod represents. The less expensive ones are not suited to tripods of this scale. Pan-tilt and geared heads tend to be less stiff than their ball counterparts, so if do choose to go down this route, get the biggest, stiffest one that you can. Feisol CB-70D The CB-70D is the largest and stiffest ball head that I have tested. Normally it is so massive that it dwarfs the underlying tripod, but that is not a concern here. Sirui K-40X The price to performance of the Sirui K-series heads is unmatched, and should thus pair well from a stiffness and value perspective. Again, any of the full size ball heads should work just fine for this tripod. Just because your full size ball head of choice here doesn’t mean it won’t work just as well. I chose these heads largely because they match the tripod very well from a size and value perspective.